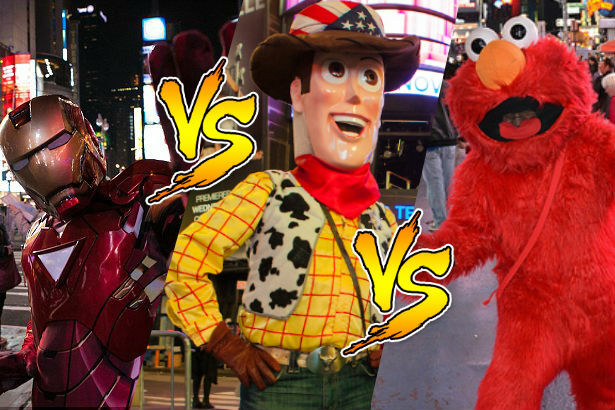 October 22, 2014 – The tension in the underground world of organized mascoting hit a potential boiling point Wednesday, when Sesame Street agents Elmo and Cookie Monster effectively assumed control of the corner of 44th & Broadway, in front of Toys R Us, away from the Avengers. Anonymous sources from inside both organizations suggest that by Friday, the battle for frolicking and begging turf in Times Square may escalate into all-out war. While it is difficult to pinpoint when tensions took root, one can speculate that following the acquisition of Marvel by Disney, more characters began to appear in Times Square, leading to increased disputes about respective begging turf. Groups began to form based on denomination, or cartoon ethnicity, to address the growing quarrels, but not all mascots are happy with the new arrangements, including one Cookie Monster who was so frustrated, he threw a child to the ground at the mere sight of Puss in Boots. As of now, the superheroes stand poised to defend the territory they've managed to claim since 2008, while wandering bands of Monsters, or the politically correct term Muppets, have started terrorizing the mascot community, culminating with the incident of a Spider-Man getting curb-stomped in front of the Jamba Juice on 47th. Meanwhile, the Pixar/Dreamworks authority have done their absolute best to keep the peace. As of press time, parents were unable to negotiate the release of their six-year-old daughter, whose legs were being held by the Naked Cowgirl, and whose arms were being held by Batman, in front of the Bubba Gump Shrimp Co.